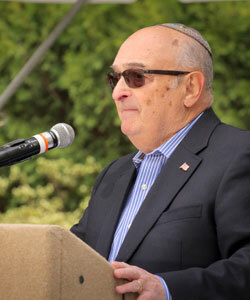 In 1942, when Stanley Berger, then Shachne Hiller, was 2 years old, his mother, Helen, smuggled him out of the Krakow ghetto and into the care of a Polish Catholic couple, Josefa and Bronislav Jachovitch. Helen rejoined her husband, Moses, in the ghetto. The two eventually would die in Auschwitz. But before that happened, authorities realized that the little boy was missing from the ghetto and began a search for him. The Jachovitches, keeping their word to protect the child entrusted to them, went into hiding. The three hid in farmhouses, in silos, and in a Gypsy village. At the war’s end, the three returned to Krakow. Shachne did not know he was Jewish and he went to church every Sunday. The couple became very attached to Shachne, and sought advice from their parish priest about adopting and baptizing him. The young priest asked if Shachne had any surviving relatives and Josefa Jachovitch told him he did and mentioned three letters which Shachne’s mother had left with her. Once the priest learned Shachne had living relatives, he said he could not condone the conversion. That priest was Karol Wojtyla, the man who would later become Pope John Paul II. Stanley attended the Hebrew Academy of Greater Washington, Coolidge High School and the University of Maryland. An accountant, Stanley Berger is the chief financial officer of a clothing manufacturing group in New York City. He moved to Connecticut in the late 1980s.